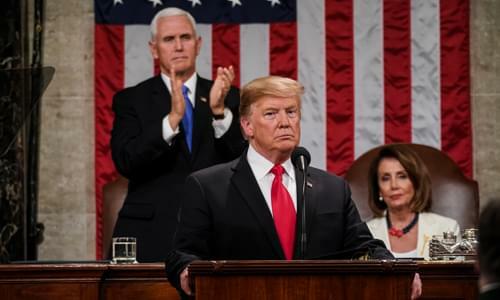 On Wednesday’s Mark Levin Show, President Trump’s State of the Union was excellent! Now we know why Nancy Pelosi didn’t want him to do it! The liberals are going mad over it; he slammed socialism, he took on late term abortion, and re-stated the case for the border. Despite the historic improvement in unemployment, the liberal Democrats just sat on their hands. While, many in the media fawned over President Obama’s SOTU speeches, they stopped short of offering President Trump similar praise. Instead they took exception to his speech tossing critiques like “psychotically incoherent speech” and other derogatory comments. Trump kept the focus on keeping America and her security first, unlike the left. Which begs the question: what exactly about America do they love at CNN, at MSNBC, in the Democratic Party? Then, leftists continue their false argument that all immigrants are good for America; but the argument is over legal versus illegal immigrants coming into the country. Also, capitalism is not a system, it’s the free flow of commerce; to suggest otherwise is simply wrong. Companies are business to make a profit and from those gains they can create jobs for society. Later, the leadership crisis in Virginia continues as the embattled Governor Northam refuses to resign, the Lt. Governor Fairfax fends off sexual abuse allegations, and now their Attorney General Mark Herring, the third in the line of succession for the Governorship, announced he too has dressed up in blackface as a teenager.